Blanch a few collard green leaves in boiling water for a few minutes. Then drudge into an ice bath for 1-2 minutes. Pat dry. Lay collard green flat and place sliced bell peppers, sprouts, a few slices of avocado and 2 Tbsp. of hummus inside. 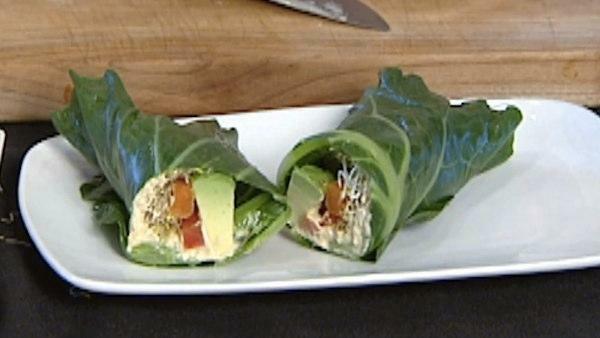 Wrap collard green tightly by rolling it up (as if it were a tortilla wrap) and cut in half. Enjoy or store in refrigerator for up to one day.